Since the first spark of mortal life took form, the daemons have sought to extinguish it. Evil in its purest form, these terrors seek nothing less than the end of all existence. Led by the Four Horsemen - War, Famine, Pestilence, and Death - the armies of Abaddon work to corrupt, consume, and destroy everything around them. Perfect nihilists, the daemons seek only to be the last entities looking down on the dying cinders of the cosmos before they themselves are consumed, and only darkness remains. Complete descriptions of the Four Horsemen and their armies of soul-devouring daemon servitors. An overview of the wasteland realm of Abaddon, the private domains of its masters, and several other forsaken locations. Rules for the daemon-worshipping souldrinker prestige class. An introduction to the soul economy, and how captured souls are traded and used by fiends and mortals alike. Secret histories of previous Horsemen. New daemonic spells and magic items. Overviews of the different castes of daemons, plus tips and tricks to aid in their summoning. Statistics for eight new daemons ready to bring the horrors of the cosmos to players' doorsteps. 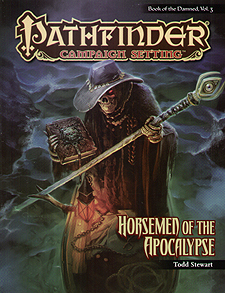 Horsemen of the Apocalypse is intended for use with the Pathfinder Roleplaying Game and Pathfinder campaign setting, but can easily be used in any fantasy game setting. While Horsemen of the Apocalypse is a standalone product, it also serves as a companion to Princes of Darkness: Book of the Damned, Vol. 1, which details the legions of Hell, and Lords of Chaos: Book of the Damned, Vol. 2, covering the hordes of the Abyss.